Rather than opting for a pantomime staple, the Customs House this year has chosen north east folktale – and song – the Lambton Worm as its inspiration. It’s the 150th anniversary of the song, which tells the story of a giant worm that wreaks havoc in County Durham until it’s defeated by local nobleman John Lambton. 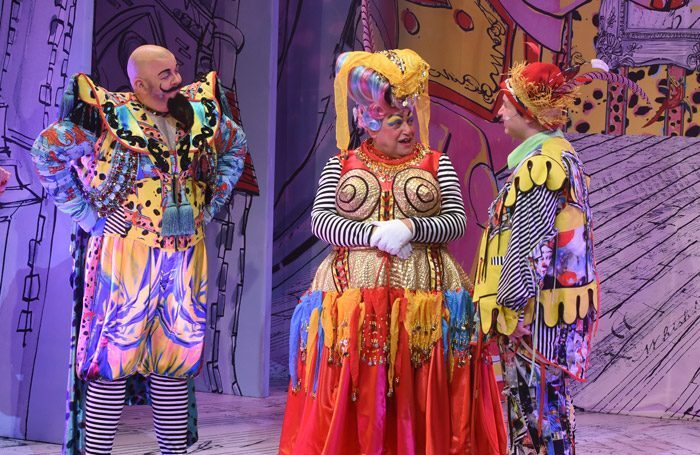 But while the source material is a bit novel, the production is very much a traditional panto, sticking closely to the same template the Customs House has been using for years. As usual, director and co-writer Ray Spencer is the heart of the show, in his element as Dame Bella Ballcock, with his trademark mixture of bad puns and double entendres. He is joined again by David John Hopper as her slow-witted son Arbuthnot whose charisma and willingness to fall over a lot makes him a massive hit with the audience. The only problem is that the other cast members are largely put in the shade. The other star of the show is Paul Shriek and Matt Fox’s set with its vivid and intricately detailed scenic backdrops, which weave the lyrics of the Lambton Worm song into the landscape.